This is probably the most personal of all of Dr. Davis’ messages. 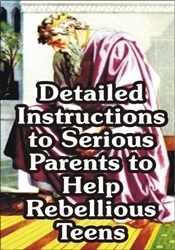 Since the message Changing the Heart of a Rebel was released in 1994, many parents have sought counsel from he and his media secretary daughter concerning how to implement the principles given in the message. One day after spending an hour and a half counseling with one such family, Dr. Davis walked into the church auditorium where most of his messages originate. He sat down in a chair, looked at the camera, and personally spoke for nearly an hour about which of his videos to use and how to use them to help turn around rebellious teens. Changing the Heart of a Rebel gave the Biblical principles. Detailed Instructions gives practical advice concerning how to implement those principles. This may also be Dr. Davis’ most urgent and compelling call to parents challenging them to “pay the price” to reach rebellious youth. This DVD can also be purchased at a reduced rate in our 3-DVD Help for Rebels Starter Set.